The call has gone out throughout Dream Land – the First Annual Ghost Trap Competition has begun! 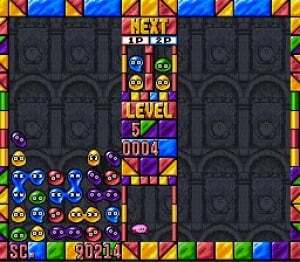 This is basically Puyo Puyo given a lick of paint, but... wait a minute, isn't that exactly what Damo typed for Dr. Robotnik's Mean Bean Machine? Well, it holds true for this game as well. Only this time, instead of Dr. Robotnik and various robots from the Adventures of Sonic the Hedgehog cartoon, it's Kirby and various classic Kirby enemies. 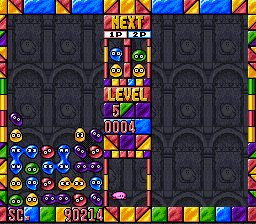 If you've played Puyo Puyo or Mean Bean Machine you know what to expect here - coloured blobs ("Beans" in Mean Bean, "ghosts" here) fall down and you have to connect 4 or more of the same colour. Stack them in various ways to create combos, which will make garbage or "refugee" beans drop down in your opponent's playing field. If the third column from the left fils up to the top of the screen, you lose! Unlike Mean Bean Machine, you can choose what level to start the main game on. 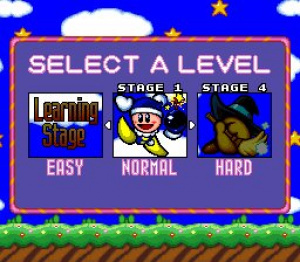 If you pick "Hard", for example, you will skip stage 1-3 and start at the 4th one. Kirby's main game is slightly longer than Robotnik's - It's 16 stages long instead of 13, however, the first three stages are "Training" stages and offer pretty much no challenge at all. Of course, the final opponent you'll face is King Dedede. You can modify the difficulty of the enemies in the options section, much like Mean Bean Machine. The music is nice - A whole bunch of remixed Kirby songs. They're all fast-paced and fit the frantic fun of Puyo Puyo well. Unfortunately, unlike Mean Bean Machine, the game does not feature passwords. This means you cannot skip directly to King Dedede to practice your skills, you have to fight your way to him every time. 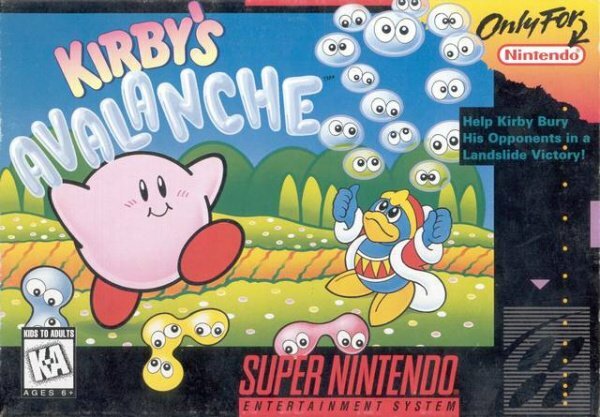 Puyo Puyo or Kirby fans should check this game out. If you're only a casual player with no preference for Kirby or Sonic, though, I would suggest Mean Bean Machine, as it has a slight edge over this game due to the password system and (In my opinion) has a better soundtrack. Another minor thing to consider if that Mean Bean Machine can be played with a Wii remote since it's a Mega Drive/Genesis game - Just because Avalanche/Ghost Trap is a SNES game, you'll have to grab a GameCube or Classic Controller every time you want to play it!